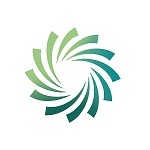 In November 2015 an Taoiseach Enda Kenny announced that Saint Joseph’s Community College will receive funding in excess of €1 million under the capitals school’s programme. This funding will be used to enhance the school’s infrastructure and to further support the broad curriculum at junior and senior cycles within the school’s catchment area. The original school building dates back to the 1950’s which comprised of classrooms and accommodation for the Marist Sisters. In the late 1960’s an extension to the school was developed to accommodate an increase in pupil numbers and to provide for a number of specialist classrooms. Subsequent developments saw the inclusion of a number of prefabricated buildings. 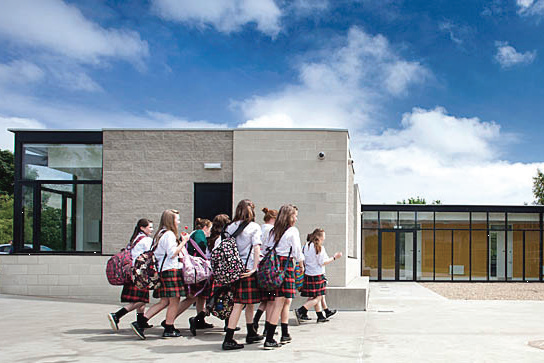 The school offers a comprehensive range of subjects, both academic and practical, offering both Junior Certificate and Leaving Certificate Programmes including the Leaving Certificate Vocational Programme (LCVP) and Transition Year. All subjects are taught at both Higher and Ordinary levels. In 2014, Music was added to the curriculum and currently is studied by students in both junior and senior cycle. 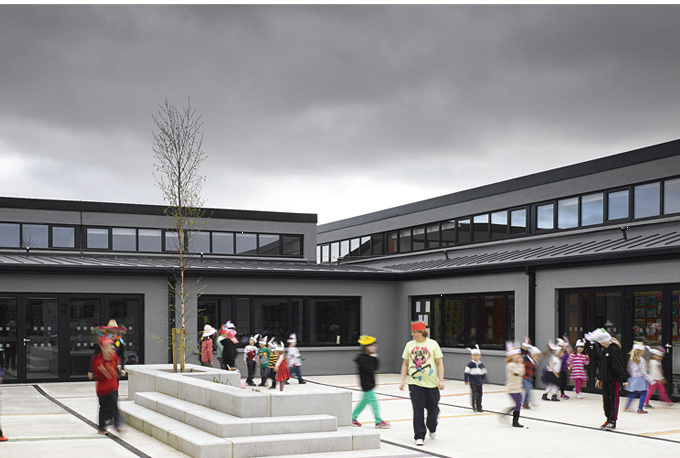 The subject does not have a designated specialist classroom however the schools buildings development provides for its inclusion within Phase III. In 2016 Metalwork/ Engineering was introduced into the curriculum with first year students and transition year students initially studying the subject. The subject is temporarily established within an existing classroom and a specialist Engineering classroom is catered for within Phase I of the schools buildings development plan. A glazed link will connect into an existing corridor and overlook an external courtyard offering natural light and full supervision of both the internal and external spaces. It is proposed to open up the existing entrance space to create a more open and welcoming space and to aide existing wayfinding and supervision issues. 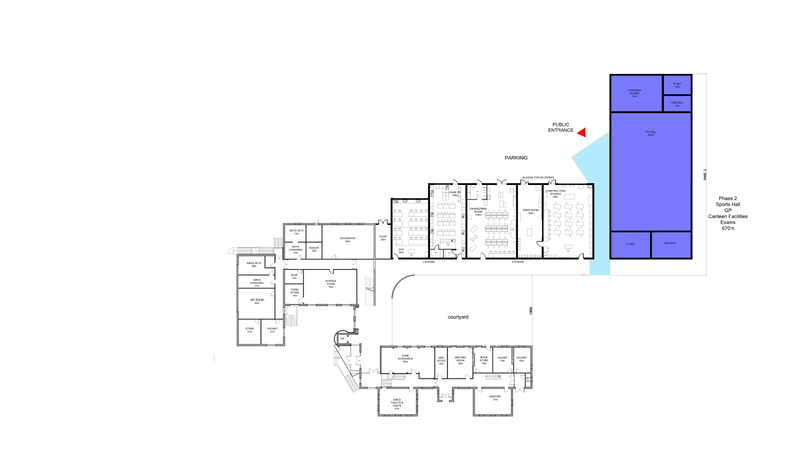 It is also proposed to relocate the existing main staircore to aide connections from the existing and proposed phases. The required accommodation is located off this link in a single storey extension, maximising the opportunities for roof lights within the practical rooms. 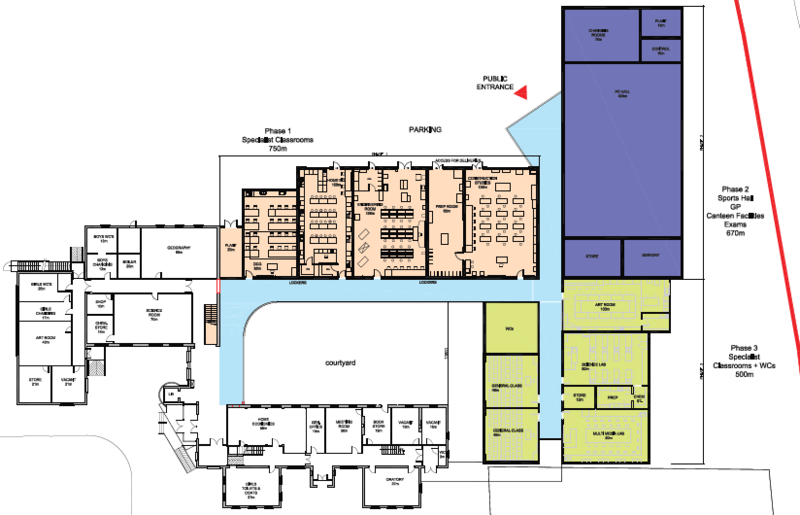 A new DCG Room, Home Economics Room, Engineering Room and Construction Studies Room with a shared Preparation Room and a new plant and boiler space are included within Phase 1. 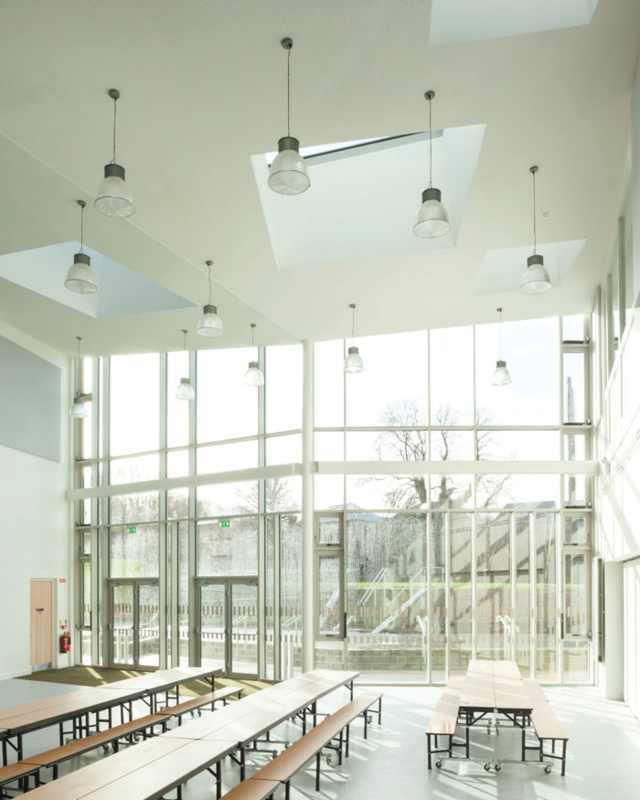 This extension will create a strong link to the existing school, create an internal focus for the school, maximising security and supervision and provide the specialist and technical classroom accommodation required by the school. The second phase of the proposal looks to strengthen this central focus by creating an internal space to compliment the external courtyard created in phase one. This will become the General Purpose Space and ‘heart’ of the school which it currently lacks. A space large enough to accommodate school events and assemblies. A new canteen adjacent to this space will facilitate the preparation of basic snacks for students at break times. This space will also be utilised for indoor sports for students and for after school activities for the wider community with a separate adjacent parking and entrance to aide security and supervision to the remainder of the school. This location is adjacent to existing external playing pitches and sports courts. The third phase of the proposal looks to strengthen the previous phases. 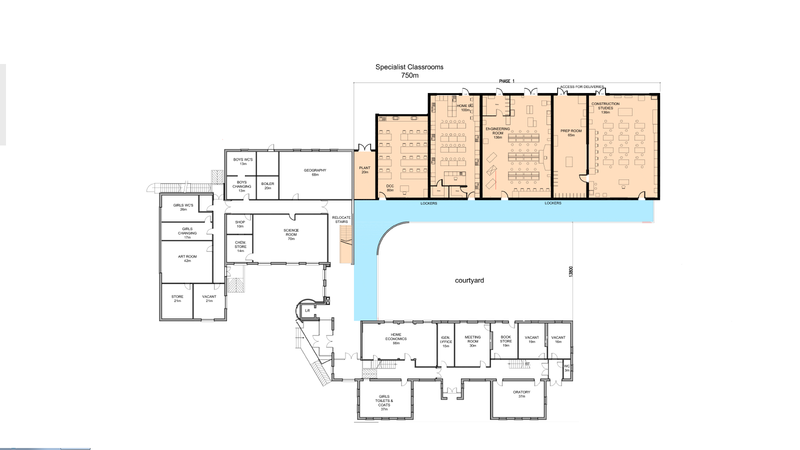 This phase proposes to enclose the courtyard and form a possible complete link connecting to the existing school and thus reinforcing the existing buildings need and conservation within the school. This phase includes other essential specialist and technical classrooms that have inadequate provision within the existing school. There is also provision for 2 No. 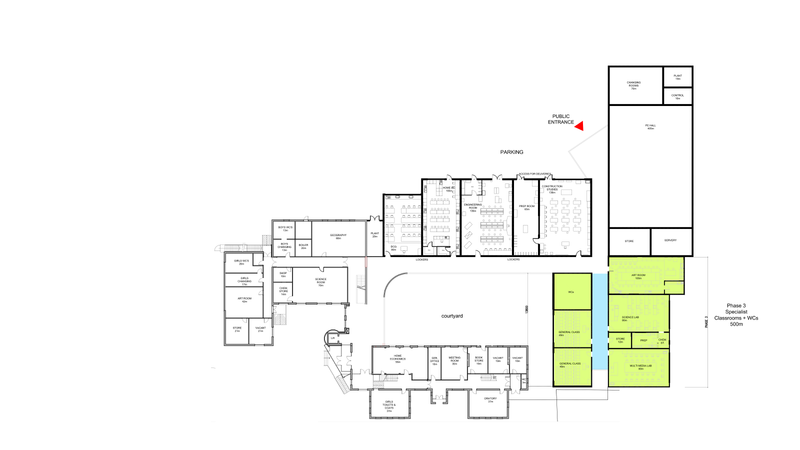 general classrooms and extra sanitary facilities.